Basics EOS – A serious contender for Ethereum? EOS made a very provocative and promising statement in its whitepaper even before its Initial Coin Offering (ICO) statement: “Decentralize Everything.” Whether this succeeds in attacking Ethereum, which goals the EOS token pursues and who is behind EOS, we show you in the following article. EOS – The New Ethereum? In terms of functionalities and objectives, EOS is very similar to Ethereum. EOS and Ethereum want to create a blockchain based platform. It aims to develop commercial decentralized applications by providing all necessary core functionality to the developer to build blockchain applications similar to web-based frameworks. 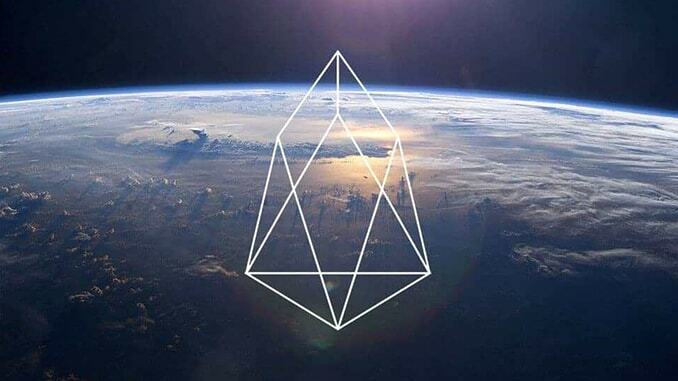 Compared to Ethereum, EOS offers a Delegated Proof of Stake – DPoS (Ethereum plans a proof of stake in Phase 4). Proof of Stake Algorithm – without “delegated” means that new tokens are unlocked by mere possession in your wallet (staking). In addition, the owner validates the transactions on the blockchain with the share and thus contributes to the security of the network. In essence, “delegated” means that members of the network select “witnesses” to validate the transactions. For EOS-based developments, this means that companies themselves must hold the token to validate transactions or other EOS token holders can delegate their share to other developers and companies. The transaction itself is free. It’s just about owning tokens. Critical views focus on the possibility of small groups of individuals being able to control the platform through DPoS. Another peculiarity is that hacks and other fatal errors in the system are handled by Rollback Actions (rather than Hard Forks) as part of the “Supermajority Consensus”. This means that they can be remedied by restoring previous databases. This would be a clear advantage over Ethereum. It should be noted, however, that EOS is still in a conceptual status. In contrast, Ethereum is already much advanced. With Raiden and Plasma, Ethereum will probably be able to process one million transactions per second. The ICO of the token began on June 27, 2017 and ended on June 01, 2018. The ICO was divided into two phases. In the first phase, 20% of the tokens were sold for about 185 million USD in the ETH. In the second phase, another 70 percent of tokens were sold. 10 percent are allocated to the company and employees of block.one. According to the company, the goal behind this unusual ICO is to give interested parties enough time to find out about the project and make an informed decision. Since EOS is still largely conceptual, the ICO was conducted based on Ethereum. As with OmiseGo, it will have its own blockchain in the future. The ICO was so successful due to the great marketing of block.one. Mainstream media, such as Reuters and the New York Times did already write about EOS before the ICO. EOS immediately got into the top 10 of all crypto currencies in terms of market capitalization. The opinions about EOS on the internet are very controversial. On the one hand, there are the supporters who say that Dan Larimer, the founder of BitShares and Steemit, has a lot of experience and reputation in the project. As a result, the project must inevitably succeed, according to the supporters of Larimer. The implementation of the big goals is only a matter of time. On the other hand, there are many who say that Dan Larimer should have completed his other two projects before embarking on the next project. Many see Dan Larimer therefore as a symbol of the ICO madness, which has raged in 2017. If someone collects hundreds of millions of dollars as part of his third ICO and makes big promises in his white paper, that screams for fraud. According to them, it’s just about collecting as much money as possible within the ICO and not about the project. Is EOS a good investment? Ethereum has the first-mover effect on decentralized apps. However, there are more and more platforms (such as EOS) where smart contracts can be programmed on the blockchain. Whether block.one will become a strong competitor with his token, remains to be seen. What do you think about EOS? Rip-off or promising cryptocurrency? We appreciate your opinion in the comments.